Nicki: Think I’m playin? Think this sh*t is a f*cking joke? Think it’s a joke? Think it’s a joke? Think it’s a joke? Say one more disrespectful thing to me, if you say one more disrespectful thing to me — off with your head! Nicki: Don’t tell me I’m insecure, don’t tell me I’m inadequate … you gonna get sent [inaudible] just fall back; don’t … you don’t know [inaudible] I don’t feel inadequate. You’re the insecure one sittin’ up there running down her resume every five minutes. Nicki: Every time you take a shot at me I’ma take it back, and if you gotta f*cking problem then handle it. I told them, I’m not f*cking putting up with your f*cking highness over there … figure it the f*ck out. Figure it out. Mariah: … do I have a 3-year-old sitting around me??? Nicki: I’m not sitting here for 20 minutes and having you run down your resume everyday, No! Goodbye! 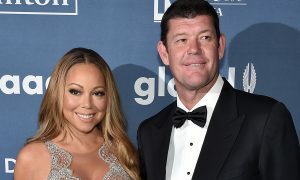 Mariah: Listen … I can’t see my kids because you decided to make … to have … to have a little baby fit and going all around the stage. 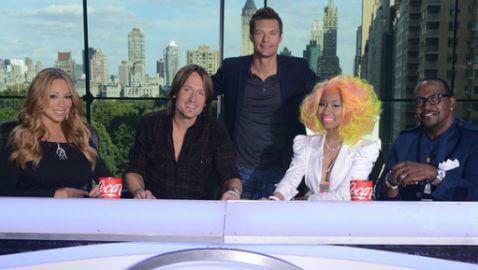 Nicki: Good, well then go see them now, go see them now … you’re boring as f*ck, you’re boring as f*ck. The producers of the show appear to be very worried about how the two judges are going to get along for the duration of the program, which does not begin airing until sometime in January.